I may have overextended myself on the book club front! I now attend 3 bookclubs a month, one of which I am running. It might sound like fun, reading 3 books a month that you may never have normally picked up but I'm struggling to read all 3 and find time to read my favourites. In the last month alone, 3 books (Fuse by Julianna Baggott, Calculated in Death by J D Robb and The Indigo Spell by Richelle Mead) have been released by authors whom I adore and I don't have time to read any of them. On the plus side, I am running the Science Fiction and Fantasy book club so at least I am guaranteed one book I love a month (oh the power!). And I get to socialise instead of being a book worm shut up at home all by myself, then there's all the wine too. 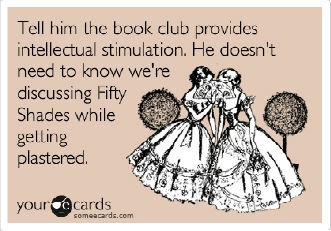 Humm, maybe 3 book clubs a month isn't so bad after all!